Born and raised in the Boston area, Charlie was a regular on the local club circuit by his mid teens. His first big break came as a member of the Greater Boston Youth Jazz Ensemble led by John LaPorta. A stint in the 18th U.S. Army Band followed where he was a featured soloist on clarinet and saxophone, as well as staff arranger. After the Army, Charlie received a B.A. degree in jazz history from UMASS Amherst, and an M.A degree in jazz techniques from Goddard College. He has held faculty positions at the College of St. Rose, Schenectady County Community College, the University at Albany and is an Artist-in-Residence at Hartwick College. Over the years he has been a sideman or opening act for such musical heavyweights as Cannonball Adderley, Roland Kirk, Aretha Franklin, Patty La Belle, B.B. King, Tom Jones, Paul Anka, Sonny and Cher, Debbie Reynolds, Peggy Lee, The Lettermen, The Vogues and Steve Lawrence and Edie Gorme, to name a few. 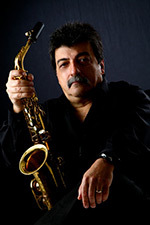 A respected woodwind artist, clinician, arranger, record producer and educator, Charlie is the former Director of Recording and Broadcast Services at UAlbany, Albany, NY. He was also musical director and featured soloist with the late, great, blues legend, Ernie Williams. Presently, Charlie is Saxophone Arist-in-Residence at Hartwick College, Oneonta, NY.